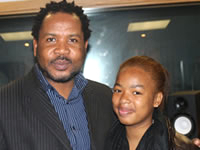 Ntlantla Swana is a young and talented musician from East London, in the Eastern Cape Province. At the tender age of only 16, she is already a great vocalist, pianist, saxophonist, composer and music arranger. She is a Grade 11 pupil at Clarendon High School for Girls, in East London. The talented Ntlantla jetted off to the United States of America on 25 July 2013 to represent Africa in the International Teen Talent Competition which will be held at the Lee University in Cleveland, United States of America from 25 – 08 August 2013. The visibly excited Ntlantla is currently doing a one-week internship program at the Eastern Cape Audio Visual Centre (ECAVC). ECAVC has sponsored her with free studio time to record her single song. “I am very excited and nervous at the same time about the opportunity to represent my country and the entire African continent in the USA. I am also excited about the internship program that I am doing here at ECAVC. I am learning about sound engineering, music production and music business. I can’t wait to record my single this Friday”. She says with a broad smile. Sy Ntuli, the Director of ECAVC, added “Eastern Cape is very proud of Ntlantla Swana, and we congratulate her for having been selected to represent Africa in the International Teen Talent Competition. She is a multi-instrumentalist. If you think she is a great vocalist and saxophonist, wait until you hear her play the piano, then you will know what I am talking about. It is our mandate, as ECAVC to support artists, and we are over the moon with her achievements”. At Clarendon High School for Girls, Ntlantla has already received the following music awards: Best Woodwind Player 2010; Best Music Student 2010; Best Saxophone Player 2012; and has participated in the National Arts Festival as a member of the Standard Bank National Youth Jazz Ensemble, playing saxophone. The multi-talented Ntlantla Swana is capable of bringing the cup back to South Africa. We are right behind you Ntlantla, go out there and fly the African music flag higher!! !